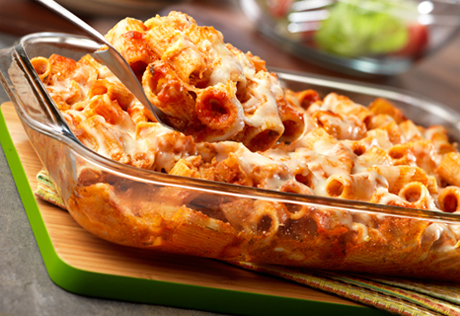 Rigatoni, sautéed onion and three cheeses are mixed together with a jarred spicy Italian sauce that comes out of the oven hot and bubbly, and absolutely delicious! Heat the oven to 350°F. Spray a 13x9x2-inch baking dish with vegetable cooking spray. Heat the oil in a 12-inch skillet over medium heat. Add the onion and cook for 5 minutes or until tender, stirring occasionally. Stir the onion, sauce, rigatoni and ricotta cheese in a large bowl. Pour the rigatoni mixture into the baking dish. Sprinkle with the mozzarella and Parmesan cheeses. Cover the baking dish. Bake for 35 minutes or until the mixture is hot and bubbling.